Lemon GreenTea: A merry pre-Christmas sale at Festival Mall! A merry pre-Christmas sale at Festival Mall! 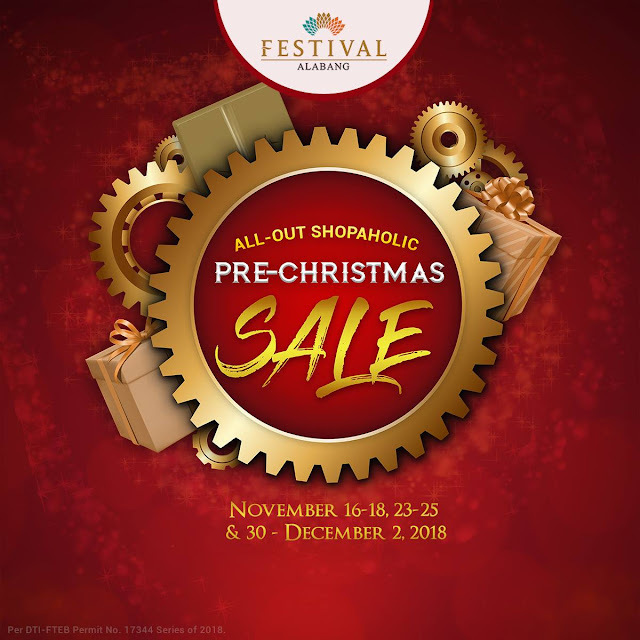 Festival Mall’s All-Out Shopaholic Sale has returned for a Pre-Christmas edition on November 16-18, 23-25, and 30-December 2. The weekend mall-wide sale will feature product discounts as high as 80% off to help keep the holiday spending just within budget. Joining the sale are local chic brands like Bayo, Unica Hija, and Plains & Prints, and trendy shops like Artwork, Burrp Tees—perfect places to find gifts for fashion-savvy teens. Drop by the Expansion Wing area to find the latest kicks from Sperry and Geox, or check out the main mall’s selection of shoes from Complex, Converse, Pabder, Sebago, and more. Shopping for kids’ gifts is also made easier with marked down prices for toys at Kids Depot, Toytown, and Ram’s Hobby, and generous discounts on apparel from Chicco, Baby & Kids, and Barbie. Find a romantic present for a loved one at Blue Magic and Bear Cuddler, or take a look at Acme Jewelry’s and Stella Jewelry’s 50%-off items to purchase sophisticated accessories for less. Welcome the holidays early with Festival Mall’s awesome pre-Christmas treats! Festival Mall is a Filinvest Lifemall and a premier development in Filinvest City, Alabang, Muntinlupa City. It is the only mall with five anchor stores: Shopwise Supercenter, SaveMore, Robinsons Department Store, Ace Hardware and Handyman. It has over 700 shops, almost 4,000 parking slots, various food outlets, and indoor amusement rides. The community’s needs and passions find balance at Filinvest Lifemalls, where the city’s heart beats.